Chelidonia Villas is owned and run by the family of Triantafyllos Pitsikalis . Our clan has been settling in Chelidonia Bay for at least eight generations. We firmly believe that this charming and pristine quarter in the heart of Oia must be kept as it was over the centuries. Most of the Chelidonia buildings once were owned by family members and relatives. After humble beginnings in 1979 we have been constantly upgrading the villas and enlarging the ensemble year after year. Latest task was the reconstruction of the house Triantafyllos’ great-grandmother had lived in. Our main idea was always to offer real homes to our guests. All villas had been real homes before, housing then large families. From outside they have remained the same, but inside all is according to upscale standards. 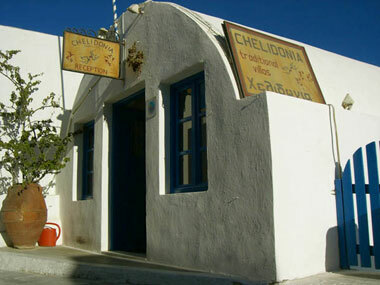 At the Chelidonia reception on Oia main street you will either meet Triantafyllos, Leandros or Paris. Computing, relaxing and resting facilities are in the same building.